Police have named two suspects killed after a mass shooting in San Bernardino, California, left 14 people dead at a social services center. The man and woman, Syed Rizwan Farook, 28, and Tashfeen Malik, 27, were killed in an exchange of fire with police. Syed Rizwan Farook had been a San Bernardino public health employee for five years, police chief Jarrod Burguan said. The attack took place at an event on December 2 for Syed Rizwan Farook’s colleagues. None of the victims has been identified. The Inland Regional Center, where the shooting took place, provides services for people with developmental disabilities, but the shooting appeared to be unrelated to its clients. The incident marks the deadliest mass shooting in the US since 26 people were killed at a school in Newtown, Connecticut in 2012. Jarrod Burguan, who said another 17 people were wounded, said police were “reasonably confident” that there were just two shooters. A third person seen running from the scene was detained, but police said it was unclear whether that person was involved. Both suspects were killed in their vehicle after a shoot-out with police involving 20 officers. A tip-off had earlier led police to a house in nearby Redlands. The dead man and woman were believed to be a couple, the police chief said. They were armed with assault rifles and semi-automatic handguns and wore military-style clothing. According to the US Bureau of Alcohol, Tobacco, Firearms and Explosives (ATF), two of the four guns recovered were linked to “an individual associated with this investigation”. They are investigating the origin of the other two guns. One police officer was injured, but his injuries are not life threatening. Three possible explosive devices were found at the Inland Regional Center, where the shooting took place. Jarrod Burguan said that Syed Rizwan Farook had left the event – which was possibly a holiday party for employees or a meeting – “under some circumstances that were described as angry,” and returned with Tashfeen Malik. Earlier, the FBI said it was not ruling out the possibility of terrorism but the situation was still being investigated. San Bernardino is a city of about 200,000 people, 60 miles east of Los Angeles. The attack took place in a conference area where the San Bernardino County Department of Public Health was holding a social event, said Maybeth Field, the center’s president. Syed Rizwan Farook, who was born in the US, worked for the county as an environmental health specialist, police said. They had no information on whether he had a criminal record, nor further details on Tashfeen Malik. 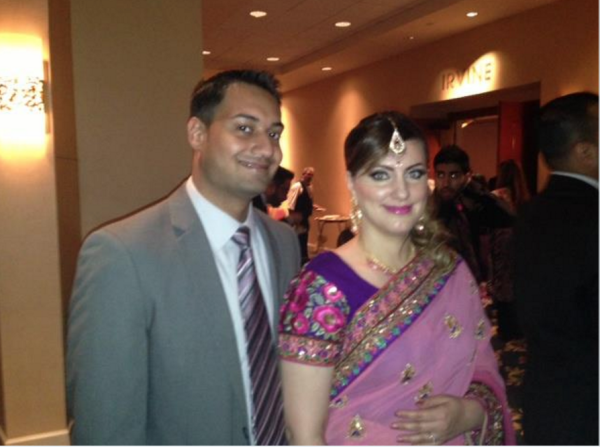 Colleagues told the Los Angeles Times that Syed Rizwan Farook had traveled to Saudi Arabia and returned with a new wife. The couple had a young baby, they said. His brother-in-law, Farhan Khan, told a press conference he had “absolutely no idea” what could have prompted the shooting. The mass shooting comes just days after three people were killed at a Colorado Planned Parenthood clinic. President Barack Obama said in response to San Bernardino shooting: “One thing we do know is that we have a pattern of mass shootings in this country that has no parallel anywhere in the world.